Son of team principal Hans-Jürgen Abt and nephew of former DTM racer Christian Abt, the Kempten-born Daniel Abt comes from a strong motorsport family. The German needed some time to find his rhythm in the highly challenging electric-racing series but finally made his breakthrough in the second season. 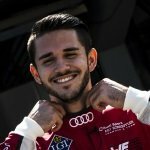 Abt is one of the most popular drivers in the series as he is known for his easy-going and fun attitude, which he also loves to showcast on his highly admired YouTube channel. Furthermore, he is one of Germany’s most talented young drivers, having been named Germany’s Motorsport Talent of the Year by the Deutsche Post Speed Academy twice in the past. After beginning his car racing career in ADAC Formel Masters in 2008, Abt took that championship the year after. 2010 saw a move into Formula 3, finishing 2nd in the German series with two wins. After a year in F3 Euroseries in 2011, he moved to GP3 in 2012. After an impressive second half of the season, he finished as runner up in the championship behind Mitch Evans, and ahead of fellow Formula E rival António Félix da Costa, following a thrilling season finale at Monza. 2013 saw a move up to GP2, however Abt struggled with a mix of bad luck and a lack of pace. 2014 saw a move to the German squad Hilmer Motorsport, but this was not much better and he chose to miss the season finale in order to race in the Putrajaya ePrix. 2015 saw him make the move into the WEC with the Rebellion Racing team, winning the non-hybrid LMP1 class at the Le Mans 24 Hours at his first attempt, while in 2016 he competed in the ADAC GT Masters category alongside Formula E.